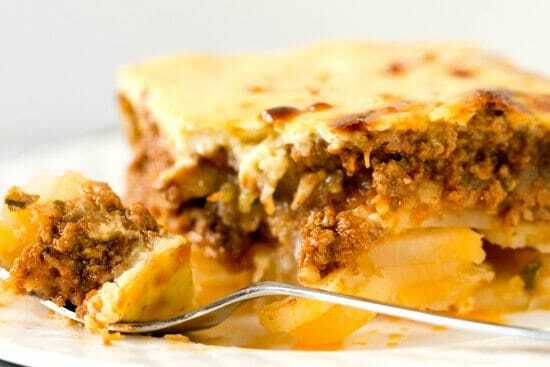 I have a very special place in my heart for moussaka. Almost four years ago, I made my very first trip to visit my Chief Culinary Consultant in DC for the weekend. I got there on a Friday in the early evening, and after spending some time catching up, we decided it was time to grab some dinner. There was a fabulous little Greek restaurant within walking distance of his apartment that he had raved to me about, so we decided to go there. I pored over the menu, not able to make up my mind between all of the dishes – they all sounded so good! My CCC recommended the moussaka, which I had never had, so that’s what I ordered. 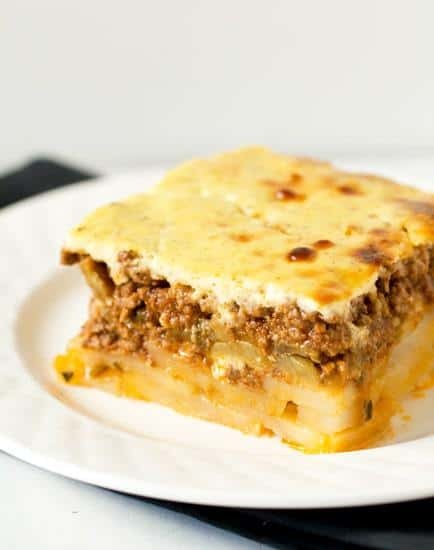 The layers of potato, eggplant, spiced beef and béchamel sauce melted in my mouth – so many different flavors and texture, and they all melded together so beautifully. I was so happy that I took his recommendation; it remains one of the best meals I’ve ever had. After all these years, I finally made this incredibly special meal at home! This Greek-style lasagna casserole is such a warm, cozy comfort food. It does take a bit of time to assemble and bake, but it’s one of those kitchen projects that don’t feel tedious, but rather enables you to truly enjoy the process of putting together a fabulous home-cooked meal. This dish will always remind me of that very first weekend spent in DC with my Chief Culinary Consultant, and it will always make my heart and my belly smile. Sprinkle the eggplant slices with salt and let drain in a colander for 1 hour. Rinse, squeeze out any excess water and pat dry. Heat ¼ cup of the olive oil in a large saute pan over medium heat. Add the eggplant and cook, turning occasionally, for 6 to 8 minutes, or until lightly browned on both sides (if you don't have a pan big enough, do this in two batches). Remove from the pan with a slotted spoon or spatula and drain on paper towels. Reduce the heat to low and add the remaining ¼ cup of olive oil to the pan. Add the onion and garlic and cook, stirring occasionally, for about 5 minutes, or until the onion is softened. 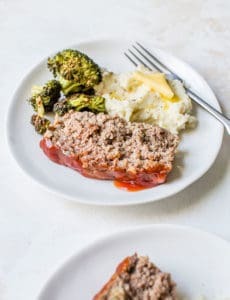 Increase the heat to medium, add the ground beef and cook, stirring and breaking up the meat with a spoon, for about 10 minutes, or until browned. Add the tomato puree, allspice, and sugar, and season with salt and pepper. Reduce the heat and simmer for 15 to 20 minutes, or until all the liquid has evaporated. Remove from heat and let cool, then fold in the egg white and parsley. Meanwhile, prepare the white sauce. Place the milk in a small saucepan and bring to barely a boil, then remove from the heat. Melt the butter in a large, heavy skillet over medium heat, then stir in the flour and cook, stirring frequently, for 1 minute. Remove the pan from the heat and gradually pour in the hot milk, whisking constantly until the mixture is smooth. Return the sauce to medium heat and simmer, whisking constantly, for 10 to 15 minutes, until thickened and smooth. Remove from the heat, and whisk in the nutmeg, salt and pepper. Whisk the cream and egg yolks into the white sauce and spread it evenly over the surface of the dish. Bake for about 50 minutes, or until the top is golden brown. Remove from the oven and let stand for 15 minutes before serving. 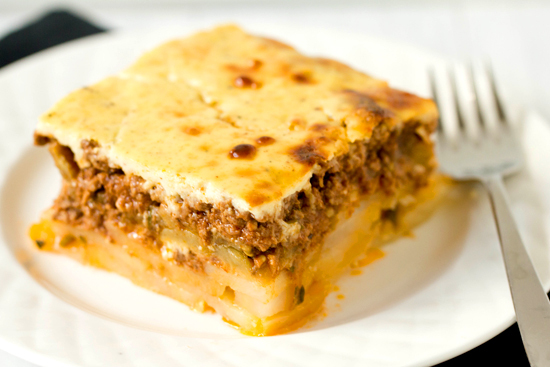 I just put my moussaka in the oven – can’t wait for the 50 minutes to pass. 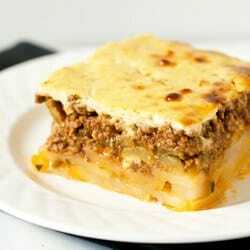 I did use ground lamb instead of the beef, just because I grew up on a sheep farm and I just love a lamb moussaka. Thanks for the recipe and the inspiration (and your lovely pictures of the perfectly cut slice). Years ago I took a holiday to Greece n fell in love with their food! 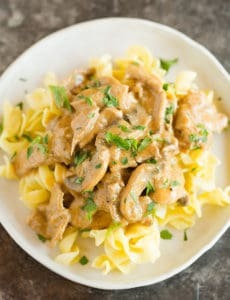 I am so excited to make this at home. It’s one of my favourite places in the world with some of my favourite dishes! Thanks for sharing it with us! One of my all time favourite meals ! 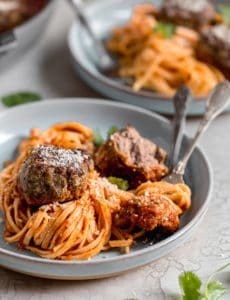 This recipe looks so authentic and delicious. In my college days, we used to frequent an out of the way Greek restaurant, where they provided plates to smash in the traditional dancing. What fun it was, good times, and where my love for this dish was created. I haven’t found a recipe to match my memories, but this one sounds spot on. I will surely be making this for my family soon ! Made this and loved it! Worth the time, and my kids loved it too! I added a bit more garlic, salt and pepper. Next time I will add a bit more allspice to the meat. This recipe is a keeper! By “tomato puree” do you mean tomato sauce or crushed tomatoes or something else completely?